Graphs are mathematical constructs consisting of vertices and edges. Many computational problems can be expressed as graph problems. For example, planning a route between subway stations translates into finding a path between to vertices of a graph. Another example is planning pipe lines between oil rigs, which corresponds to creating a graph connecting a set of vertices. 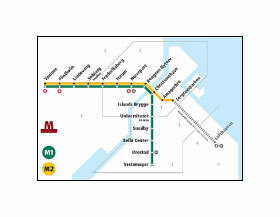 The Copenhagen metro system, expressed as a graph. You may be familiar with algorithms for solving shortest path or minimum spanning tree problems. The benefits of this kind of translation of real-life problems into graph problems include access to a wide range of effective algorithms. Graph representations thus allow for fast and reliable problem solving. This site is dedicated the a special kind of graph, namely the t-spanner. The t-spanner is used to solve problems where a set of vertices need to be connected in such a way, that the shortest path between any two vertices is bounded. This site will introduces some of the algorithms needed to construct t-spanners, as well as examples of real life problems where the t-spanner is useful. The t-spanner is primarily used to model geometric objects. For simplicity, this presentation considers vertices to be points in a two dimensional space. The described algorithms do, however, work equally well in other dimensions. As the graph represents a geometric object, the weight of an edge between two vertices equals the euclidian distance between them. Spanners and the t-spanner : Characteristics of the t-spanner. The greedy algorithm : A greedy algorithm for construction t-spanners. The Θ-graph : A t-spanner with special properties. Applications of the t-spanner : Examples of real life problems where the t-spanner is useful. Applets : Interactive applets and a slide show to illustrate the greedy algorithm and the Θ-graph. 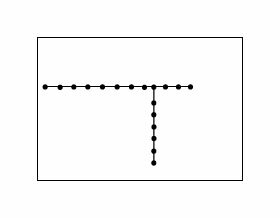 Exercises : Test your understanding of t-spanners, the greedy algorithm and the Θ-graph. Further reading : Links to external sources about spanners and their applications. Word list : Short explanations of the terms used in this presentation.